Hurdles Cleared for Property‐Assessed Clean Energy (PACE) Financing ‐ Governor Jerry Brown created a Reserve Fund in early 2014 to allow residential PACE programs to flourish throughout the state. The CaliforniaFIRST PACE program launched in Alameda County in August 2014, allowing homeowners County‐wide to finance renewable energy, energy efficiency, and water efficiency upgrades on their property tax bills. The program makes ambitious energy‐saving projects more accessible for homeowners. Green Building Ordinance for Private Development - The City adopted a green building ordinance for private development in 2010. Oakland’s ordinance applies to construction projects for most types of buildings, including residential and nonresidential new construction, additions and alterations, and alterations to historic buildings. Visit the City's green building portal to learn how this ordinance may affect you and to find resources to help you build green. 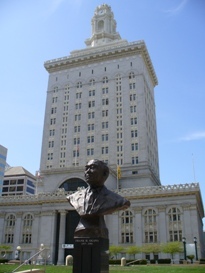 Civic Green Building Ordinance - On May 17, 2005, the Oakland City Council unanimously adopted a Civic Green Building Ordinance, adding Oakland to a growing list of U.S. cities that officially promote green building techniques. Oakland’s Green Building ordinance requires that all new buildings owned or occupied by a City Department or Agency that equal or exceed $3 million in construction costs meet a minimum Silver rating under the U.S. Green Building Council's (USGBC) Leadership in Energy and Environmental Design (LEED) rating system, and be so certified by the USGBC. 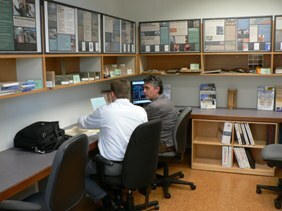 Green Building Resource Center - The City's Green Building Resource Center (GBRC) is conveniently located next to the Planning & Zoning Counter on the 2nd floor of 250 Frank Ogawa Plaza. The GBRC was established in 2000 to provide the public with easy access to educational materials about the benefits of sustainable building practices. Over 23,000 people have visited the Center since its opening in 2000. Oakland Green Buildings Map - Oakland is home to many commercial, institutional and residential certified green buildings. Visit the Oakland Green Buildings Map to learn more about local green buildings. Overall Energy Use Down - City-wide energy use has decreased 2.2 percent since 2005. While electricity use has risen by 3.3 percent, it has been offset by a 5.4 decrease in natural gas use. Residential use accounts for nearly half, or 47 percent, of the City’s total energy use. Under the banner of the re‐launched statewide Energy Upgrade California brand, the Home Upgrade and Advanced Home Upgrade programs are enabling scores of families to conduct major energy efficiency work in return for a hefty rebate of up to $4,500. Since the program’s launch in August 2010, more than 220 Oakland homes have undergone energy upgrades through these programs. From January through July in 2014 alone, program participants saved a total of 19,987 kWh in energy. A related resource available to all Oakland residents is the Home Energy Analyzer, a free online tool that tracks energy use and suggests simple adjustments residents can make to save money on their utility bills. Weatherization and Energy Retrofit Loan Program - Income-eligible property owners can access 0% interest loans ranging from $6,500 - $30,000 for weatherization and energy efficiency improvements to owner-occupied residential properties of 1 - 4 units. View eligibility requirements and instructions to apply. 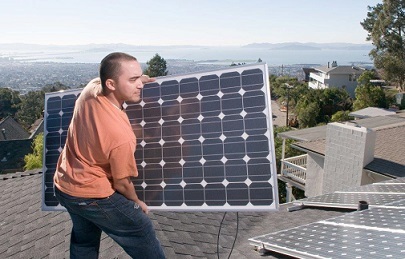 California Youth Energy Services - The California Youth Energy Services (CYES) program has been providing Oakland residents free energy conservation services and hardware since 2005. CYES hires and trains local youth to provide free in-home energy audits, education, and hardware installation to low income homeowners and renters. In 2014, CYES provided employment and training to nine Oakland youth ages 15-22, and provided 253 Oakland area households with energy-saving devices and education. Facility Energy Retrofits - The City of Oakland has retrofitted 128 of its 140 largest facilities, creating savings of over $1 million per year to the City's budget. Solar Energy - The City has installed 1 Megawatt of solar electric panels on the rooftops of our Municipal Service Center and the downtown ice rink. These panels provide approximately 2.3% of our municipal electric load. The City has also installed solar thermal systems on Fire Station 18 and the East Oakland Sports Center. Green Business Certification - The City has received green business certification for its Civic Center and Municipal Services Center facilities. 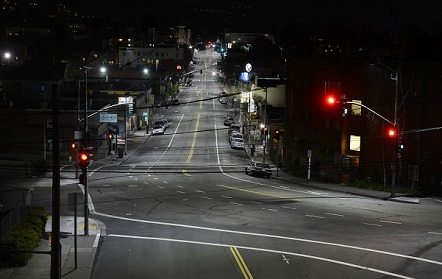 New Energy Efficient Streetlights Installed City‐Wide - Approved by Council in 2013, the City finished converting more than 30,000 cobrahead street lights to more energy‐efficient, US‐made LEDs in June of 2014. The new streetlights are expected to save the City $1.4 million in annual energy costs. With a total project cost of $15 million, project financing will be repaid entirely through PG&E rebates and energy savings. In addition to enhancing public safety with better light quality, the new fixtures use half the energy and have a longer lifespan than the old technology, thus reducing maintenance and utility costs. The change will eliminate over 400 metric tons of CO2 per year through energy efficiency alone, and exceed the emissions reduction targets set forth in the City’s Energy and Climate Action Plan. “Smart” Parking Meters Hit the Streets - In Spring 2014, the City replaced all of its 3,800 coin‐only, single‐space parking meters in retail and business districts, including over 700 old, broken, and missing meters, with new, state‐of‐the‐art "Smart Parking Meters." The new meters retrofit onto the existing poles, and allow payment by coin, credit/debit card, and mobile phone. The meters use solar powered rechargeable battery technology and are managed wirelessly through a web‐based management system, lowering maintenance and energy costs. The technology upgrade is expected to increase parking‐related revenues by an estimated 15%, paying for itself in five years, as well as increasing access to local businesses as more parking spaces are now available. The cost of parking remains the same as with the old meters. 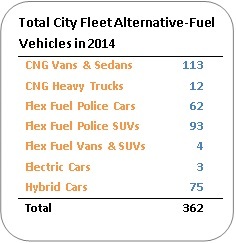 More Hybrid and Electric Vehicles in City’s Fleet - Since 2012, the City has expanded its fleet of fuel efficient vehicles to a total of 362 by the end of 2014, representing approximately 20% of the City fleet. These include compressed natural gas (CNG) vehicles, hybrids, and “flex fuel” vehicles that can run on regular gasoline or up to 85% ethanol blends. Energy Reductions Planned for City-Owned Parking Garages - Oakland PublicWorks is designing energy efficiency retrofits for seven municipal parking garages. Technologies being considered include LED fixtures that use half the energy of the current fixtures, yet produce the same amount of light and have a longer product life; motion-sensing controls that minimize lighting and energy consumption when large areas are unoccupied; and exhaust fan controls that reduce energy consumption when fewer cars are running. In garages where retrofits save enough energy to offset the additional load, the City is exploring installation of plug-in electrical vehicle charging stations. 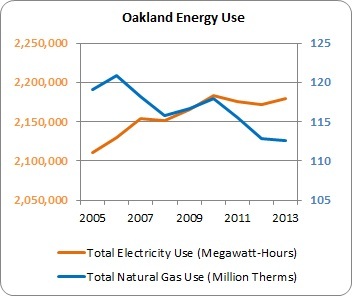 View more information about Oakland's internal operations Energy Group. 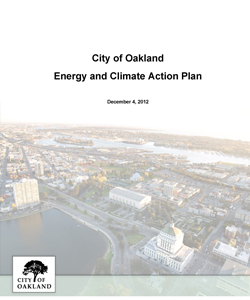 Oakland Energy and Climate Action Plan - The Oakland Energy and Climate Action Plan (ECAP) was adopted by the Oakland City Council on December 4, 2012. The purpose of the ECAP is to identify and prioritize actions the City can take to reduce energy consumption and GHG emissions associated with Oakland by 36% below 2005 levels. The ECAP establishes GHG reduction actions, as well as frameworks for coordinating implementation and monitoring and reporting on progress. The ECAP will assist the City of Oakland in continuing its legacy of leadership on energy, climate and sustainability issues. Learn more about the development of the ECAP. The City and its partners throughout the community have made significant implementation progress on priority actions identified in the ECAP. These include adoption of the City's Green Building Ordinance, identification of Priority Development Areas, expansion of bicycle networks, participation in Energy Upgrade California energy efficiency programs, the City's ground-breaking Zero Waste programs, and many more actions that are advancing GHG reductions. View the November 2012 ECAP Implementation Progress Report. Climate Adaptation - Oakland's Energy and Climate Action Plan (ECAP) includes a set of actions aimed at increasing local resilience and helping Oakland to adapt to the projected impacts of climate change. Oakland is also participating in the regional Adapting to Rising Tides (ART) project, led by the San Francisco Bay Conservation Development Commission (BCDC) and the National Oceanic and Atmospheric Administration (NOAA). The ART project, which began in late 2010, was created to advance regional understanding of how sea level rise and other climate change impacts will affect the Bay Area's ecosystems, infrastructure, and economy. The ART project will also begin to explore adaptation strategies that may benefit Oakland and the region.